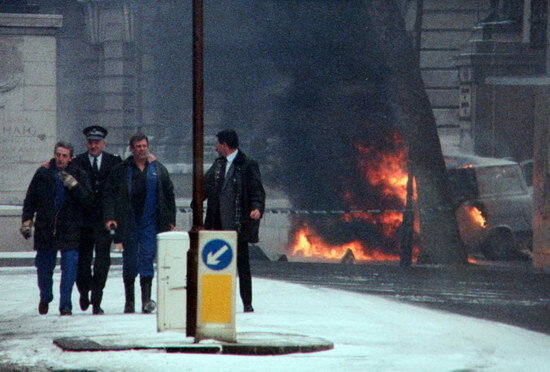 A van burns after it was used by the IRA to launch the 1991 mortar attack on 10 Downing Street, London, the official residence of the British prime minister. Salah Abdeslam, the sole survivor of a 10-man ISIS cell that carried out the November 2015 coordinated terrorist attacks across Paris, went on trial today in his hometown of Brussels. He was arrested in March 2016 in the Belgian neighborhood where he and many of those in his ISIS cell had grown up. But the lines between terrorists and criminals are less clear now than ever, said Peter Neumann, director of the International Centre for the Study of Radicalisation. Feb. 6, 2004 — Moscow: An unknown group detonates explosives on the metro, killing 40 and wounding 122. Feb. 7, 1991 — London: The Irish Republican Army launches a mortar attack on the 10 Downing Street, the official residence and offices of the prime minister, during a meeting of the British cabinet. There were no injuries. The homemade weapons were fired from the back of a van parked nearby, with at least one projectile detonating in the rear garden of Number 10, damaging the building with shrapnel. Feb. 8, 2002 — Montana: The leader of a militia group, calling itself Project 7, and his girlfriend are arrested and charged with plotting to assassinate judges and law enforcement officers in order to trigger a revolution. Authorities recover pipe bombs, 25,000 rounds of ammunition, and “intel sheets” with personal information on law enforcement officers, their spouses, and children. Feb. 9, 2009 — Sri Lanka: An LTTE female suicide bomber kills 28 and wounds 90 in an attack in Vishvamadu. Feb. 10, 2011 — Marden, Pakistan: A suicide bomber kills 27 soldiers in an attack on a military training center. Tehrik-i-Taliban Pakistan claims responsibility. Feb. 11, 1974 — Newtownabbey, Northern Ireland: Two Catholic civilians are shot as they arrive for work and are killed by the Ulster Freedom Fighters, which was a cover name used by the Ulster Defense Association. During a search of the house after the murders, authorities discovered bomb-making equipment and radioactive material they determined belonged to Russell. In Russell’s bedroom, police found a framed photo of Oklahoma City bomber Timothy McVeigh. In his car were rifles, ammunition, binoculars and a skull mask. Prosecutors later alleged that Russell had planned to bomb civilian targets, including synagogues and a nuclear power plant in Miami. He was recently sentenced to five years in prison. The key to success in the struggle ahead is self-discipline. While it is the time to be “legal” we must stolidly endure whatever the State sees fit to inflict upon us. When it is time to revolt, we must be prepared to unleash the furies of hell on the state until it yields. So while the president uses the State of the Union to once again conjure up the phantom threat of immigrant terrorists to justify wholesale changes in American immigration policy, this crew of true native sons is recruiting and organizing on college campuses and at rallies across the United States. But that’s a terrorist threat the president seemingly has little concern for despite everything we know about how serious it really is. Some years back, noted terrorism scholar Mia Bloom argued in her book, Dying to Kill, that terrorist organizations may adopt suicide tactics in part as an effort to “outbid” each other for popular support. 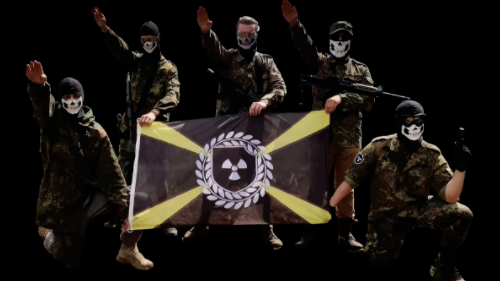 In short, when faced with political competition from a rival group, a terrorist organization may turn to increasingly brutal methods as a way to demonstrate to potential supporters both superior capability and greater commitment to their shared cause. (With apologies for the crass self-promotion) I'm wondering whether increased attacks by #ISIS in Khorasan (where we've observed an uptick in propaganda output) & today's attack by the Taliban might be a case of competition & outbidding I postulated yrs ago in "Dying to Kill"
On Saturday, a Taliban attacker driving a stolen ambulance packed with explosives, killed more than 100 in central Kabul and injured more than 150. This came only a few days after Taliban militants launched an assault on Kabul’s Intercontinental Hotel which led to the killing of 22, including 14 foreigners. If the Taliban and ISIS are in fact locked in a competition for popular support, then we can expect the carnage to escalate even as the United States prepares to send up to another 1,000 troops to Afghanistan to join the more than 14,000 already deployed there. Jan. 29, 1998 — Birmingham, Ala.: An off-duty police officer is killed and a nurse badly wounded when a nail-packed bomb explodes outside an abortion clinic. The radical anti-abortion group, Army of God, claims responsibility. Jan. 29, 2017 — Quebec City, Canada: Six are killed an 19 others are wounded in a mass shooting following evening prayers at the Centre Culturel Islamique de Québec, a mosque in Quebec City. Alexandre Bissonnette, a 27-year-old French Canadian who was described as a supporter of both French far-right politician Marine Le Pen and US President Donald Trump, was charged in the attack. 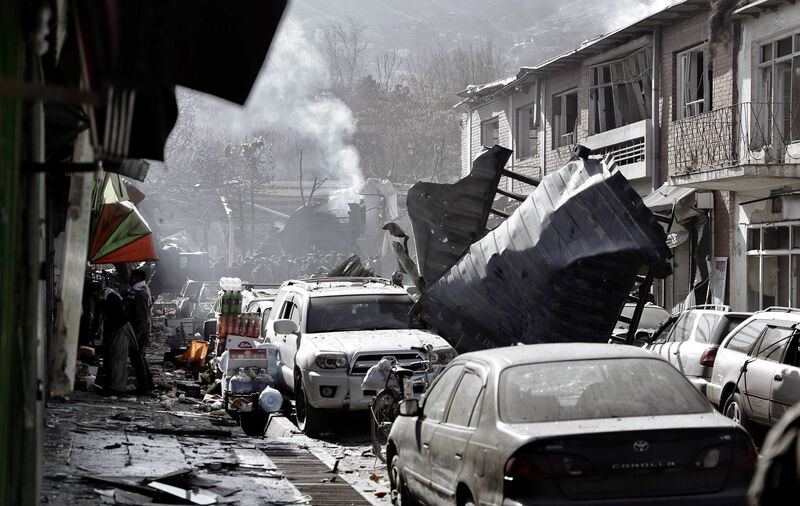 Jan. 30, 2010 — Khar, Afghanistan: A female suicide bomber kills 14 civilians and three soldiers. No claim of responsibility is made. Jan. 31, 1984 — County Armagh, Northern Ireland: Two Royal Ulster Constabulary (RUC) officers are killed in an Irish Republican Army land mine attack on their armored patrol car. Feb. 1, 2009 — Baghdad: A female suicide bomber kills 46 Shia pilgrims. Feb. 2, 2009 — Tarin Kot, Afghanistan: A suicide bomber kills 25 police officers and wounds many more. Taliban claims responsibility. Feb. 3, 1977 — Belfast, Northern Ireland: A Catholic civilian is found stabbed and with his throat cut. Members of a Ulster Volunteer Force (UVF) gang known as the “Shankill Butchers” are responsible. Feb, 4, 2009 — Barbacoas, Colombia: Seventeen civilians are stabbed to death. The Revolutionary Armed Forces of Colombia (FARC) claims responsibility. 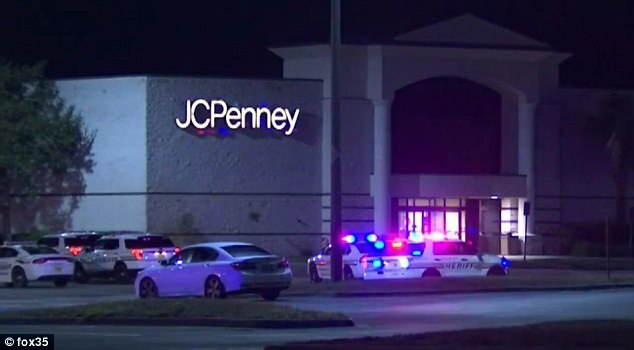 Two homemade pipe-bombs went off at a mall in central Florida on Sunday evening, causing little or no damage but prompting the evacuation of about 100 shoppers and staff. Police are seeking a “person of interest” described as a middle-aged white man with a heavy build, wearing a gray shirt and hat. Someone needs to explain the concept of domestic terrorism to these folks. It isn't just brown people that set off bombs. Now I fully understand the sentiment at work here, the perception that authorities are quick to cry terrorism when a person of color, typically a Muslim or someone thought to be Muslim, is the perpetrator of some act of violence, but call it anything but when it’s white guy who’s responsible. As I’ve written about before, there’s research that backs up the perception. And that’s the rub. Unless and until we get some evidence that gives us insight into the motivation behind any act of violence, we can’t call it terrorism, regardless of the identity of the perpetrator. This is one of the key lessons that I try to convey to my students when I teach on terrorism. I’ve written about this before, most recently following last fall’s horrific mass shooting in Las Vegas. Even now, after four months of intense investigation, police there are no closer to understanding why Stephen Paddock meticulously planned and executed his attack on concert goers from the window of his high-rise hotel room. So, did a middle-aged white guy carry out an act of domestic terrorism in Florida last night? Maybe. But maybe not. Jan. 22, 1997 — Martinton, Ill.: Authorities raid the home of accused Ku Klux Klan member Ricky Salyers, a former Marine, discovering 35,000 rounds of heavy ammunition, armor piercing shells, live ammunition for grenade launchers, and other military gear. He was also believed to be a member of Black Dawn, an underground group of far-right anti-government extremists inside the US military. Jan. 23, 2001 — Yemen: A Yemeni airliner is hijacked with 91 passengers aboard, including the US ambassador. Jan. 24, 2011 — Moscow: A suicide bombing at Domodedovo airport kills 36 and wounds 180. Imarat Kavkaz, a Chechen group, claims responsibility. Jan. 25, 1976 — Lisburn, Northern Ireland: A bomb planted by Loyalist paramilitaries at the Hibernian Social Club kills two Catholic civilians. Jan. 26, 2009 — Democratic Republic of the Congo: Attacks are carried out on several villages leaving 36 civilians dead. Democratic Forces for the Liberation of Rwanda are believed responsible. Jan. 27, 1975 — London: The Irish Republican Army plants seven bombs at locations across the city, resulting in minimal damage or injuries. An IRA bomb goes off in Manchester, injuring 26 people. Jan. 28, 1982 — Italy: Police rescue US Army Brigadier Gen. James Dozier who was kidnapped by the Red Brigades six weeks earlier.